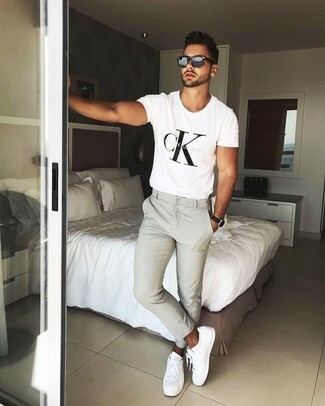 If you're on the hunt for a casual yet on-trend look, wear a white and black print crew-neck t-shirt with beige chinos. Both garments are totally comfortable and will look great paired together. When it comes to shoes, this getup is round off nicely with white leather low top sneakers. 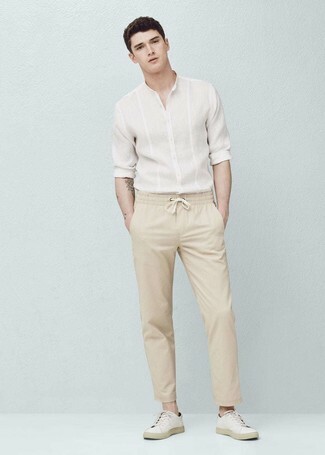 If you're on the hunt for a casual yet stylish ensemble, reach for a white linen long sleeve shirt and Gucci beige stretch cotton chino pants from Bluefly. Both items are totally comfortable and will look great together. Break up your outfit with more casual shoes, like this pair of white leather low top sneakers. 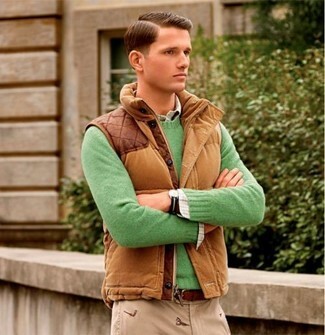 If you're after a casual yet on-trend getup, dress in a brown gilet and Gucci beige stretch cotton chino pants. Both garments are totally comfortable and will look great paired together. 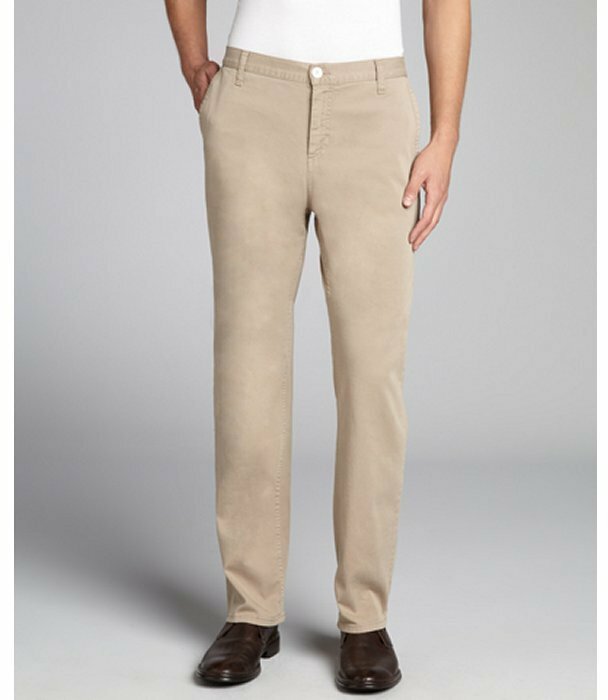 Such items as a dark brown check blazer and Gucci Beige Stretch Cotton Chino Pants from Bluefly are an easy way to infuse some elegance into your current off-duty arsenal. If you feel like dressing up a bit, add dark brown suede tassel loafers to your getup. Contrary to what you might believe, looking sharp doesn't take that much the workplace. 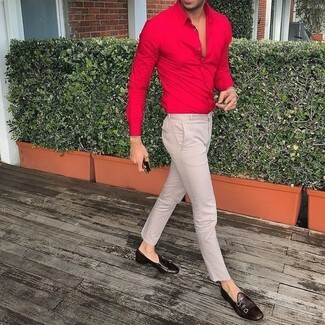 Just try pairing a red dress shirt with beige chinos and you'll look incredibly stylish. Kick up the cool of your ensemble by completing it with dark brown leather double monks. If you're in search of a casual yet dapper look, pair a yellow quilted barn jacket with Gucci beige stretch cotton chino pants from Bluefly. Both items are totally comfortable and will look great paired together. For something more on the daring side to finish off this outfit, rock a pair of white athletic shoes. As you can see, being a dapper dude doesn't take that much time. Just consider teaming a grey plaid dress shirt with Gucci beige stretch cotton chino pants and you'll look wonderful. You could perhaps get a little creative in the shoe department and lift up your ensemble with navy leather derby shoes. 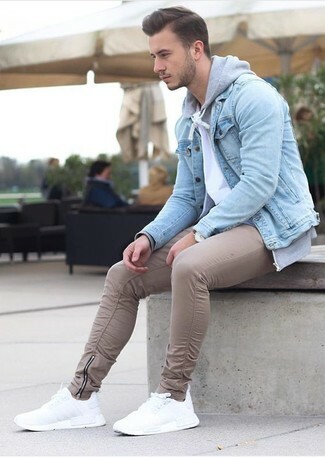 If you're looking for a casual yet dapper ensemble, pair a light blue denim jacket with Gucci beige stretch cotton chino pants. Both items are totally comfortable and will look great together. Add a more relaxed vibe to your ensemble with white athletic shoes. If you're in search of a casual yet dapper look, consider teaming an olive long sleeve shirt with beige chinos. Both items are totally comfortable and will look great paired together. Brown leather tassel loafers will instantly dress up even the laziest of looks.